Passing of Historic Vienna Inc. Board Member Frank Lancaster – July 16, 2016 | Historic Vienna Inc.
We at Historic Vienna will dearly miss our great friend Frank Lancaster and are grateful for his wonderful life. 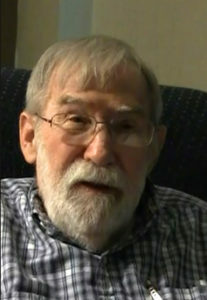 Frank was born in 1929 in Sheffield, Alabama. His father was a railroad employee, which meant the family moved all around the Southern United States. Frank attended night school at George Washington University and American University. In 1947, Frank was recruited to the CIA where he worked as the librarian and later became involved in aerial photography Frank was a steady volunteer in the town of Vienna and in the surrounding community. In 1960, he was the first manager of the newly formed Pigtail-Ponytail Girls Softball League. He volunteered first at the storefront library near the Giant and then at Patrick Henry Library when it finally opened in 1971. Frank’s kindness, patience and experience were shared freely as he served so faithfully on the Historic Vienna board of directors. LANCASTER ELBERT FRANKLIN LANCASTER, JR. “Frank” (Age 86) II Corinthians 5:8 “We are confident, yes, well pleased rather to be absent from the body and to be present with the Lord.” On the evening of July 16, 2016 due to natural causes, Dad went home to be with the Lord Jesus. Surrounded by loving family he passed peacefully from his home of 52 years in Vienna, VA. Frank was born the eldest of three sons to Elbert and Kathleen in Sheffield, AL on November 9, 1929. Born the son of a railroad man, Frank cherished the memories of moving around the south and eventually settled in Ashville, NC. After graduating high school, he moved to the Washington, DC area in 1946 where he met his wife, Lois of 53 years. He loved his career with the CIA where he loyally served for 38 years. After retirement he remained the best of friends with many co-workers. Giving freely of himself he volunteered in the community and his church. He served on the Historic Vienna Board and played the role of Santa Claus for many years at the Freeman Store. He was instrumental in introducing kid”s softball to Vienna, which was a reflection of his love for baseball. Dad enjoyed Bluegrass Music. Stories of trains, life”s hardships and victories, and love of God were lyrics he loved to dwell on. A faithful member of the Capital Baptist Church, he looked forward to his weekly bible study. Dad lived by example, impacting many lives. With God”s promise we are rejoicing in his departure, although he will be dearly missed. Dad was preceded in death by wife, Lois and daughter, Susan. He is survived by his children, Linda Wilborn (Thom), Kathy Robinson (Johnny), Vicki Bell (Tom) and Billy Lancaster (Melanie); grandchildren, Susan Wright, Franklin and Jim Nichols, Amy Bolin, Katy DeCarli, Vicki Moe, Johnny and Davey Robinson, Tommy, Matt, and Josh Bell, Cindy, Sara, and Billy Lancaster; and 10 great-grandchildren. This entry was posted in Uncategorized by David Shelby. Bookmark the permalink.